Are you interested in experiencing the Little Edo? 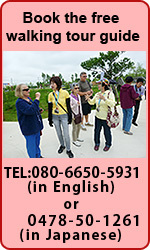 We offer you a tour guide, free of charge(English only). The central part of Sawara is designated as Important Preservation Area. Feel the genuine Japanese atmosphere in which the two storied slate-roofed shop houses with swinging shop-curtains in Edo & Meiji period are still preserved on the both sides of the streets and the river. Please send following messages, in order not to make any misunderstanding.